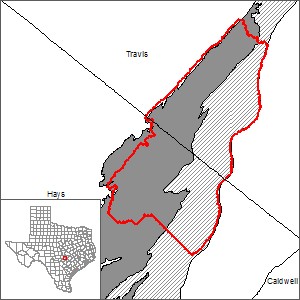 In 2011, the Texas Water Development Board (TWDB) completed the recalibration of The Barton Springs segment of the Edwards (Balcones Fault Zone) Aquifer Groundwater Availability Model, following a request by Groundwater Management Area 10 to evaluate pumping that would result in specified spring flows, at Barton Springs, of 11, 9, 7, 5, 3 cubic-feet per second under drought-of-record conditions. "Recalibration of the Edwards (Balcones Fault Zone) Aquifer – Barton Springs Segment – Groundwater Flow Model." Please contact the GAM Section (512-936-0871) for a copy of model files. The model files are available in an electronic format with a small processing fee per CD/DVD. Model grid cells are geographically assigned to counties, groundwater conservation districts, river basins, groundwater management areas, and regional water planning areas within the model study area using a centroid based approach. The model grid is available in ESRI® shapefile format and comma-delimited text file. Please see the Edwards (Balcones Fault Zone) Aquifer and the The Barton Springs segment of the Edwards (Balcones Fault Zone) Aquifer Groundwater Availability Model pages for other reports and publications. For model runs see the GMA 10 page.